From 1990 to 2004, Mr. Salem was a partner at the law firm of Akin, Gump, Strauss, Hauer & Feld, LLP, where he headed that firm's Middle East and U.S. Department of Labor practices. During the course of his career, Mr. Salem has negotiated some of the most significant settlements in the field of labor law, among them the resolution of all pending Employee Retirement Income Security Act (ERISA) cases against the Teamsters' Central States Pension Fund, the E.O. 11246 discrimination case against Harris Trust and Savings Bank, and several major Occupational Safety and Health Act (OSHA) and Fair Labor Standards Act (FLSA) settlements, including the major FLSA settlement involving Food Lion. On behalf of various Middle East clients, Mr. Salem headed the legal teams that handled the acquisitions of major assets, including refineries in the Middle East. In addition, he headed the legal team that successfully brought suit against the Department of Treasury on behalf of the owners of the Al-Shifa pharmaceutical plant in Sudan that was destroyed by the U.S. Navy. 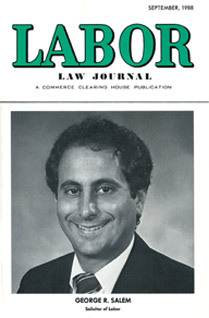 From 1985 to 1989, Mr. Salem served as the Solicitor of Labor. As the U.S. Department of Labor’s chief legal officer, he was responsible for enforcing more than 130 laws that regulate the nation's workplace, including those guaranteeing minimum wage through FLSA, ensuring occupational safety and health pursuant to OSHA, and maintaining pension security under ERISA. Mr. Salem headed a staff of 850 lawyers and support staff in 13 national offices and 16 regional and sub-regional offices around the country. Mr. Salem played key roles in the Reagan-Bush '84, Bush-Quayle '88, and Bush-Cheney '00 campaigns. In addition, he served as a member of the board of directors of the Overseas Private Investment Corporation and as chairman of the Tripartite Advisory Panel on International Labor Standards, the legal arm of the President's Committee on the International Labor Organization. Mr. Salem has written and spoken extensively on labor law and related topics and has lectured in Moscow, Beijing, Cairo, and Geneva. He is also active in several professional associations, and is listed in Who's Who in America, Who's Who in American Law, Who's Who in American Politics, Who's Who in Finance and Industry, the International Who's Who of Business Lawyers, the International Who's Who of Management Labour and Employment Lawyers, Chambers USA: America's Leading Lawyers for Business, Washington Super Lawyers and Corporate Counsel Super Lawyers, and the Best Lawyers in America. In addition, he was named by the National Law Journal as one of the top 26 labor lawyers in the United States. He is a fellow of the College of Labor and Employment Lawyers and a member of the Council on Foreign Relations. 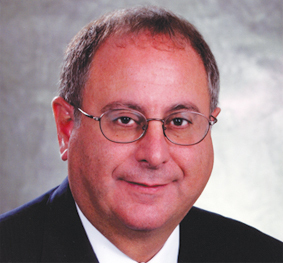 Mr. Salem co-founded the Arab American Institute in 1985 and currently serves as its chairman, and has served as treasurer of United Palestinian Appeal, Inc. since 1982. He is a past president of the National Association of Arab Americans and has served on the board of directors of the American-Arab Anti-Discrimination Committee. In 2003 he was named to the U.S. Advisory Commission on Public Diplomacy’s Advisory Group on Public Diplomacy in the Arab and Muslim World, which was assembled at the request of Congress to study the State Department’s public diplomacy efforts in these regions. On behalf of the Bush Administration, Mr. Salem served as an official observer to the Palestinian elections held in February 2005, and also as President George W. Bush’s representative to the funeral of Palestinian Authority President Yasser Arafat. In 1992 Mr. Salem received the Ellis Island Medal of Honor. The award is presented annually to Americans of diverse origins for their outstanding contributions to their own ethnic groups and to American society. ** Mr. Salem serves DLA Piper as a Strategic Advisor. He is not a member or employee of DLA Piper.